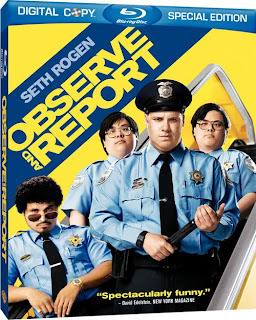 Observe and Report: Easily the ballsiest movie of the year-- Seth Rogen teams up with Foot Fist Way director/East Bound and Down co-creator Jody Hill to create a pitch-black, tartly flavored comedy that may very well make your skin crawl. But there's a twisted, inspired genius to the entire endeavor, and I'll be damned if it didn't make me laugh (and make me marvel at it's willingness to absolutely, positively see its batshit vision all the way through). Lymelife: Derick Martini's smart, often uncomfortable tale of suburban ennui hasn't gotten much attention, which is surprising considering how many skilled actors populate it (Alec Baldwin, Timothy Hutton, Cynthia Nixon, Jill Hennessy, and not one but two Culkins). It's the kind of movie DVD was made for-- one that you throw in your Netflix queue and find yourself sucked right into. Hot Fuzz and Shaun of the Dead (Blu-ray): Writer/actor Simon Pegg and writer/director Edgar Wright's two cinematic collaborations to date both hit Blu-ray today; both are sharp, funny satires with style and laughs to burn (though I have to admit, contrary to popular opinion, that Hot Fuzz is my preference of the two). Ghosts of Girlfriends Past: Hope you got your pre-orders in! THIS ONE WILL SELL OUT IMMEDIATELY. On DVD: "Thrilla in Manila"
On DVD: "The Complete Monterey Pop Festival"